For two decades "Reissmann's Tanzcafe" in Bischofsgruen was the center of off-post nightlife for most of the "Amis" from the "Hill". Otto Reissmann first opened his illustrious entertainment palace in 1961 in a separate wing of the Gasthof zur Post. In early 1965 the Tanzcafe was relocated down the street to a new, two-story building built not by Herr Reissmann, as many of us assumed, but by another local businessman. The top floor was designed specifically to accommodate the Tanzcafe. On the ground floor was a printing shop, and you could tell when the printer was working overtime, because the dance floor shook like crazy. Herr Reissmann ran a similar but smaller establishment called the "Milchbar" in Wunsiedel and later opened another in Marktredwitz. While he hopped from business to business, his girlfriend Herta, whom we called the "First Lady," ran the Tanzcafe in Bischofsgruen. Gerti was the perennial waitress who served those who preferred to sit at a table rather than at the bar. An extremely kind soul, Gerti was always ready to accept quarters for marks (at least when the exchange rate was 4 marks to the buck) and even carry a tab until payday. 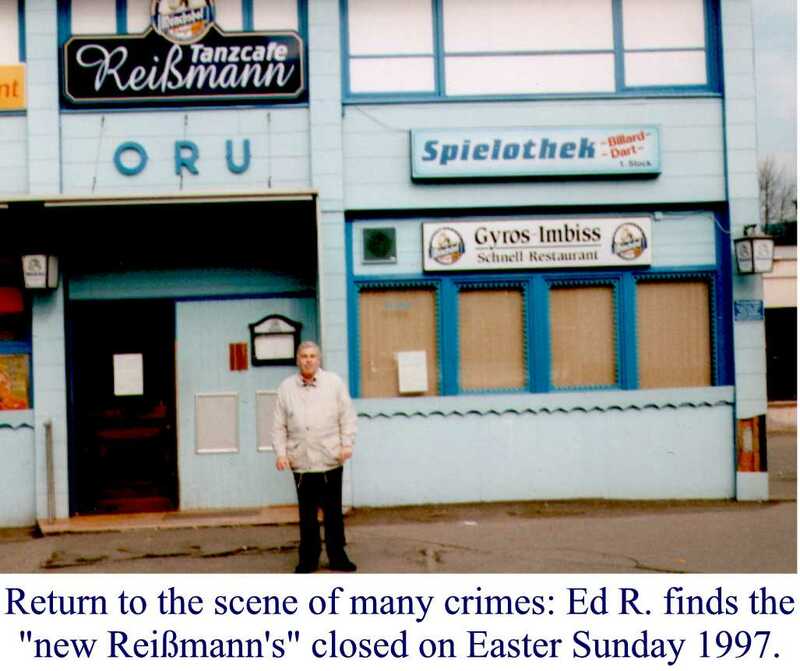 Unlike Gerti, who worked at Reissmann's from virtually the day it opened until the day it closed, the girls behind the bar came and went. Those of us who were on the Hill when the Tanzcafe first moved into the new facility will remember Elena, an Italian, Wilma, a large blond who filled in on weekends, and Erika, who worked behind the bar throughout the late '60s and who still remembers most of the guys who frequented the Tanzcafe during this period. Night after night they poured Jaegermeister, cognac & coke, an exotic beverage called Scotch, and an occasional "Lufthansa" (bubbly with a shot of brandy). And who could ever forget the infamous Gulaschsuppe which was the only nourishment served after a long evening of beer and schnapps. Guenther was the indefatigable D.J. who kept the discs spinning whenever the band took a break and during periods when there was no live entertainment. Around 1975 the venerable Herr Reissmann was killed in an unfortunate car accident, but Herta continued to run the Tanzcafe. At the beginning of the '80s Herta married a local businessman and sold the Tanzcafe, thereby bringing to an end an illustrious chapter in the history of this small resort town. The new owner renamed the establishment "Dancehall Joy" in attempt to capitalize on the disco trend. But with similar establishments popping up all over the area, competition was tough. The "Joy" was never able to latch onto the success of the original Tanzcafe. Opening hours were scaled back to 3 days a week, but the disco ultimately had to be shut down for lack of business. Around 1996/97 the establishment was reopened under its original name complete with sign above the door (see photo). People who visited the Tanzcafe during this period say that on the inside it was virtually unchanged from the day it was built. The "new" Reissmann's, however, also failed to make contact with its successful past and closed a year or so later. It remains vacant today. Gerti, Herta and Guenther still live in Bischofsgruen; Erika and Pete Ninos live in Schwarzenbach near Wunsiedel.